Our life-size replica Kid Goat is made of resin & Fibre-glass. 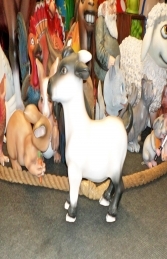 This figure is ideal for use in a farmyard scene and looks great with our other animals. 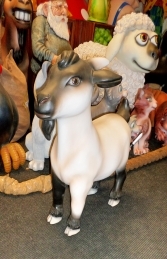 This is an ideal POS model for trade-shows, exhibitions & farm-shops to promote your Goat's milk or cheese. The Goat is fun and quirky and will raise a smile. Looks great with our other comical animals. PLEASE CONTACT US ON 01626 833646 or 07860 680181 TO DISCUSS THIS GOAT MODEL & THE OTHER FIGURES IN OUR FARM-YARD ANIMAL SERIES. 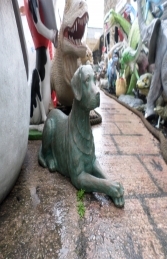 PLEASE PHONE US TO PLACE AN ORDER & FOR A QUOTE FOR DELIVERY COST TO YOUR POSTCODE.